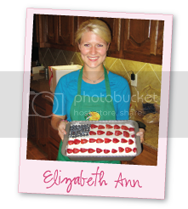 Elizabeth Ann's Recipe Box: And the Winner is. . .
0 And the Winner is. . .
Congratulation Rebecca, I will email you with the giveaway details and information! Thank you to everyone for entering and a big thank you to CSN for the wonderful giveaway! Tis the Season for CHRISTMAS CARDS! Sausage, Cheese and Crackers. . . The Joys of Teaching Middle School Girls. . .